Green Kid Crafts launched in 2010 and is the original arts, crafts, and science project kids subscription service. We are proud to be a mom and woman owned business. Like so many of the best children’s products, Green Kid Crafts is a mother’s invention, created by a working mom who wanted to make the most out of the limited time she had to spend with her kids. Like many other parents, she wanted to spend that time connecting with her kids, not scrambling for ideas and shopping for supplies. That’s where Green Kid Crafts comes in. 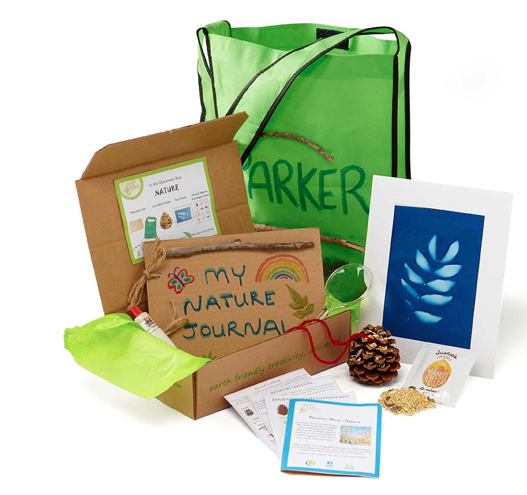 This monthly subscription service offers flexibility (from one month to a year), and each box contains high quality materials for three to four science and craft activities. Creativity Kit 1: Naturalist Kit Explore the outdoors and collect specimens from nature to review under your magnifying glass and use to decorate a field bag and cover for a Nature Journal. Finish assembling the journal and then use it to record your thoughts about nature, tell a story or draw. Creativity Kit 2: Pinecone Birdfeeder Use peanut butter and birdseed to decorate your pinecone, then string it up near a window and watch for birds! Creativity Kit : Sun Print Pick out your favorite specimen from nature and create a special sun print using “magic” paper and a sunny window. Frame it and hang in your room! Green Kid! Guide: All Green Kid Crafts Subscribers receive a copy of Green Kid! Guide (a $5.95 value) for free every month. Each issue is filled with 20+ pages of additional content for continued exploration and discovery all around the month’s theme. Hmmm, that peanut butter looks too good for the birds! Everything is made from sustainable materials, including the specimen bag made from soda bottles. I think a subscription to Green Kid Crafts would make a great gift!